Home Apacer AH730 Apacer AH750 Dual Interface OTG Flash Drives Gadgets Apacer Introduces AH730 and AH750: Dual Interface OTG Flash Drives that Make Cross-device File Sharing Easier than Ever! Is your phone creaming “running low on memory” again? Let Apacer’s latest OTG lineup be the solution! The newly released AH730 and AH750 are OTG dual interface flash drives that come with Micro USB and USB 2.0 or USB 3.1 Gen1 connectors to provide fast data transfer and capacity expansion in your mobile life. Its 360-degree swivel cover design easily shares files between your OTG compatible devices, such as smartphones, tablets, and PCs. 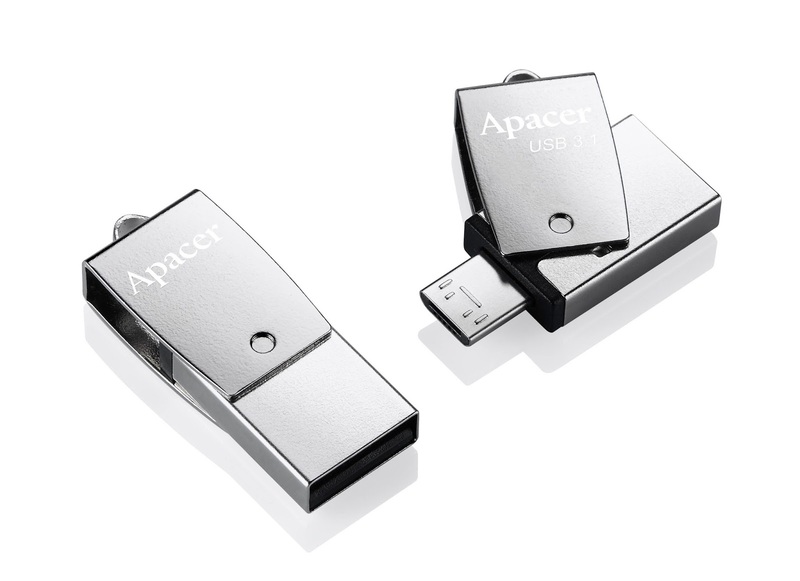 Apacer AH730/AH750 OTG dual interface flash drives are compactly designed to be tiny and portable, with only 4.5 grams. Both are exquisitely built with a polished finish and a 360° rotating metallic cover to provide protection to the unplugged connector. A strap hole is designed to allow attachment to your personal items for better convenience and portability. Plug in the Micro USB end to the OTG-supported smart devices to unload the fullness or expand the memory capacity, or connect to laptops and PCs with AH750 (for USB 3.1 Gen1) and AH730 (for USB 2.0) for high-speed file transfers. The swiftness and convenience has a much better performance than with a data cable or wireless methods. If you want to watch your favorite videos on personal devices without occupying the memory space or using up data limit during streaming, just download in advance from your PC and easily take and play the files stored on AH730/AH750 anywhere you go. Or just simply use it to copy and paste photos or contents in your phone and share with your friends! The blade-like steel swivel cover can be revolved in either direction to keep the unused connector protected. This cap-less design stays conveniently attached to the unit at all times without losing. While one port is inserted to a mobile phone and taken around to use, the other end can be kept clear of accidents from surrounding, such as spills. Available in 8GB, 16GB, 32GB, and 64GB, the lineup is compatible with Android devices supporting OTG functions on 4.1.X or higher versions, as well as various computer operating systems, including Windows 10/8/8.1/7, Linux Kernel 2.6.X and MAC OS 10.6.X and higher. FileBridge, an app exclusively developed by Apacer, is designed for easy management for files stored inside the mobile device and memory card. Use the app to enjoy simplified actions for file copying and sharing.